Pro Se Productions, a cutting edge publisher of Genre Fiction, revives one of the oldest and most exciting archetypes of fiction in its latest anthology-EXPLORER PULP! 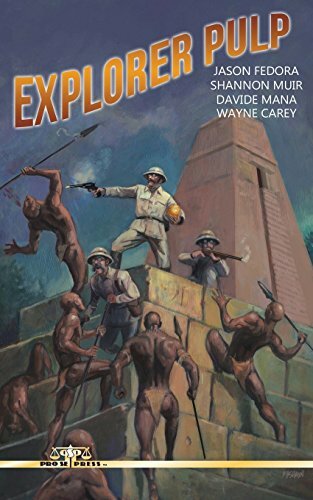 With an excellent cover by Adam Shaw and logo design and print formatting by Marzia Marina, EXPLORER PULP is available now at Amazon at https://www.amazon.com/Explorer-Pulp-Wayne-Carey/dp/1546611223/ref=sr_1_1?ie=UTF8&qid=1494944330&sr=8-1&keywords=explorer+pulp and Pro Se’s own store at www.prose-press.com for 10.00. This anthology of adventure is also available as an Ebook, designed and formatted by Marina for only $2.99 for the Kindle at https://www.amazon.com/Explorer-Pulp-Jason-Fedora-ebook/dp/B071S66TNN/ref=sr_1_2?ie=UTF8&qid=1494944330&sr=8-2&keywords=explorer+pulp and for most digital formats via Smashwords at https://www.smashwords.com/books/view/724438.